Warmth is removed from the air before it is exhausted from the building. Uses tempered exhaust air from the building to pre-heat incoming air. ‘Honeycombed’ heat transfer wheel turns slowly to maximize heat transfer and eliminate cross-contamination. Approximately 65% of the heat is transferred. 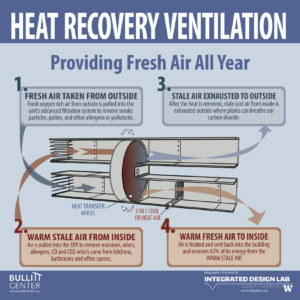 Massive amounts of treated air can be lost through a building’s ventilation system. 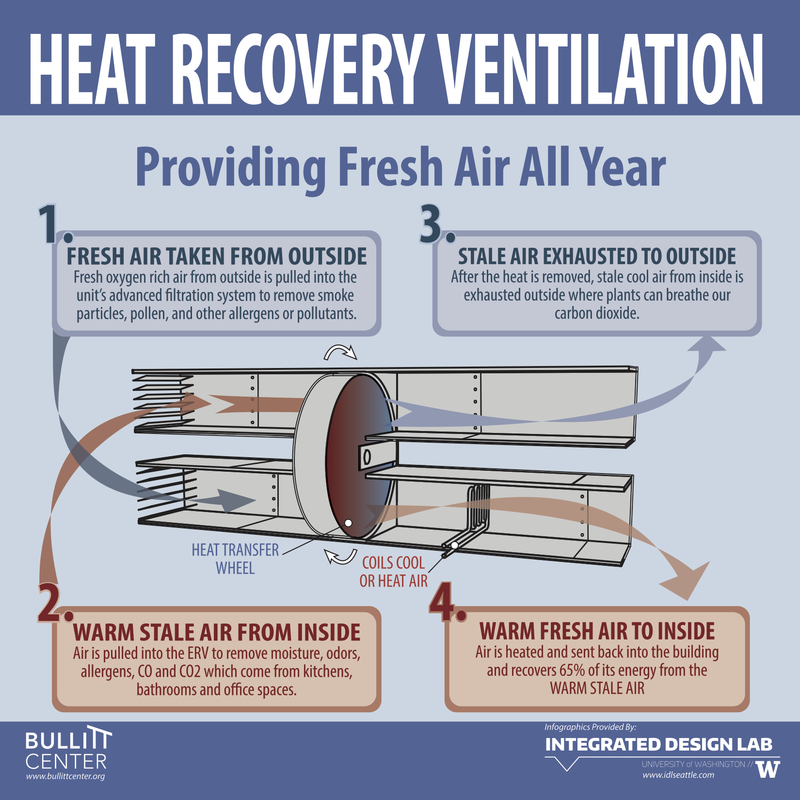 This means that the heating and cooling systems would have to work extra hard to keep the Bullitt Center thermally comfortable, which could jeopardize the goal of net zero energy use. The concept of a heat recovery ventilator is quite simple; the tempered outgoing exhaust air gives off its warmth or ‘coolth’ to the incoming ventilation air. The transfer occurs within a honeycombed, rotating drum. The material of the honeycomb is very thin and very conductive, so the heat can be transferred efficiently. The purpose of the drum is to transfer as much heat as possible without contaminating the incoming air with exhaust air. The air then passes through a hot or cold coil depending on the season, to further preheat or pre-cool the ventilation air. This coil is supplied by the ground source heat pump system. The system, developed by MEP engineering firm PAE, lives on the roof of the Bullitt Center under the array of solar panels.